So the husband mentioned a couple of months ago that it would be cool to have a grown up version of an advent calendar. I have been thinking of doing one for years, and now that he mentioned it himself, I knew I had to do it. Being the natural born procastinator that I am, I put it off for weeks and weeks until I had just a few days to put it together. But oh! What do you get for a grown man if it has to be relatively small both in size and in prize? Finding 24 of those is difficult I tell you. I finally got the last piece on Friday on my lunch break and then spent half the night making number tags and putting everything in bags in order to be able to put them up today when the husband was at work. It turned out well, I think. Some of the objects are a bit on the heavy side, which meant that I had to go a little overboard on the tape. 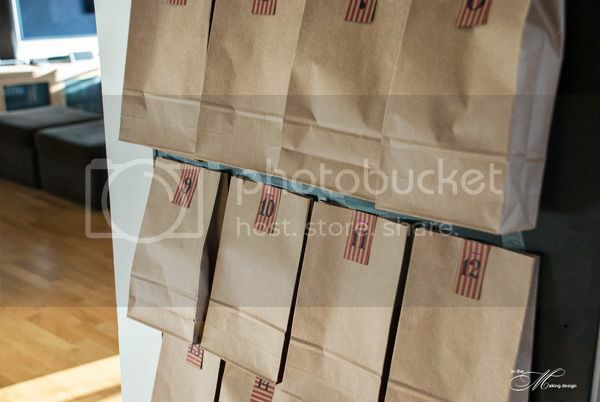 I wish I didn't have to use tape; I originally wanted to attach the bags to string. In the end I couldn't figure out a way to fasten the string to the wall without making holes. So tape it had to be. It was a great success when he came home and was able to open the first bag. I now hope the excitement lasts all the way until Christmas! 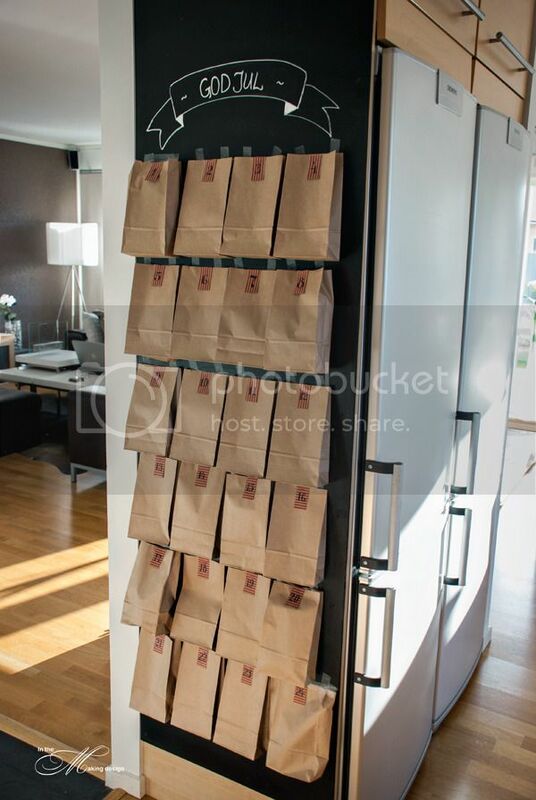 I put the bags on our chalkboard wall in the entry to the kitchen from the hallway. The chalk banner is always there but usually it says "Remember". I thought it fitting to change it to "Merry Christmas". And, ok, we won't be able to use the wall as a message board for the most part of the month but I think we will manage. As long as we remember to put the trash bin out on the right day, I think we're good. LOL! 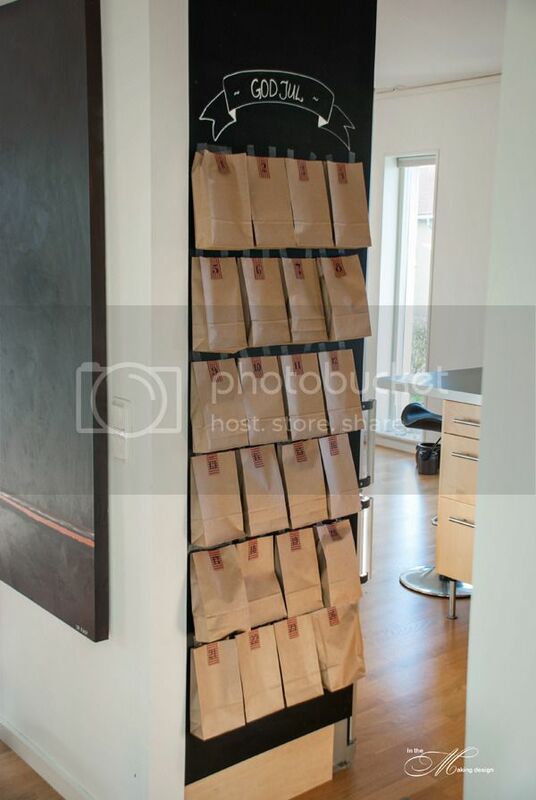 I used regular kraft paper bags to hold the items. The tags are made from red striped kraft paper that I free handed the numbers on. I had planned to print the numbers but felt it was a tad too noisy at 1.30 am. I stapled the tag to the bag, also making sure to staple the bag itself shut at the same time. It was not until this morning that I noticed that I had forgotten to change the pink staples that I had used for the BIL and SIL's wedding in August. Oh well! What a GREAT idea. I am tucking this one away for next year, but will start looking for things to go in it all year long. Thanks so much for sharing this.